As the number suggests, the 313 started life as a Country Area bus service, covering the outer section of the present route between Enfield and Potters Bar before continuing to St. Albans. For a time there was also a Summer extension from St. Albans to Whipsnade Zoo! The present section between Chingford and Ponders End garage (later to Enfield) used to be the 121 – then one of London’s shorter routes and now having shifted such that it covers only a couple of hundred yards of this route! The 313 was extended to Chingford in replacement during 1982. This was enabled by the transfer of the route into the London Transport network earlier in the year – it was heralded as a “new route” even though it was not! As such it was the first “ordinary” route to use a number above 300 – previously, route numbers in Greater London had been kept below 300, and even now they are generally kept below 500. At the same time, the 313 was withdrawn east of Potters Bar (Cranborne Road), the rest of the route being left to the 84, which became a London Country route for a short time. Ironically, operation of the route passed to LC on tender in 1985, but the devastating LCNE strike in 1988 resulted in the route passing to Grey Green. GG ran the route from its depot in Dagenham (later Barking). The nearest point on the route is Chingford, a good 10 miles away, but one early morning journey started from Potters Bar, necessitating a dead run of over 20 miles! 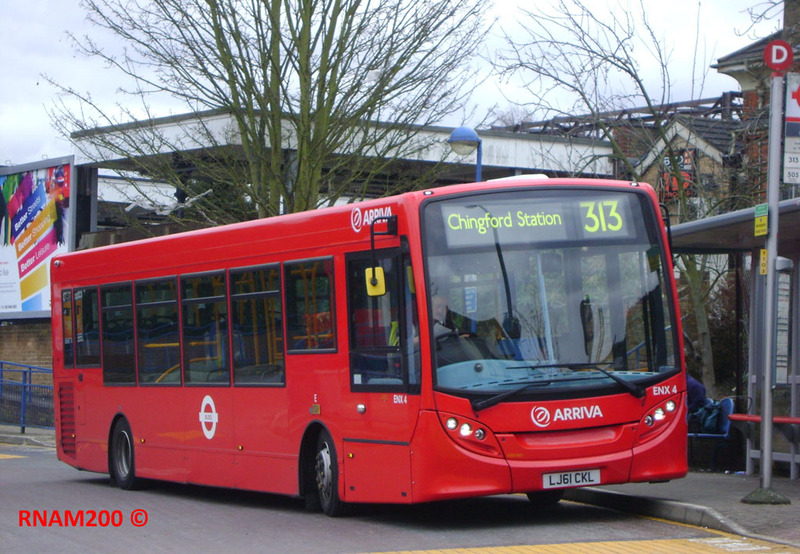 However, the consolidation of the 1990s saw Grey Green fall into common ownership within the Cowie Group with Leaside, the privatised segment of London Buses covering north London. When the route came up for tender in 1996, the opportunity was taken to transfer the route to Leaside’s much more convenient Enfield garage, which the route passes. Leaside put some rather basic LDR class Dennis Darts on the route, coupled with a frequency increase to every 20 minutes throughout – previously buses had run half hourly between Chingford and Chase Farm Hospital, and just once an hour through to Potters Bar. However, in common with most of the other routes converted to LDR operation at the time, tender renewal in 2001 resulted in new low floor buses being specified, and Arriva (the new name for Cowie) specified the DAF SB120/Wright Cadet. After two contract terms, the DAFs became due for replacement, and new E20D/Enviro200s were specified to replace them. This is essentially the product formerly known as the Enviro200Dart, but reworked to meet the latest regulations. Two photographs are provided, and the first shows ENX2 (LJ61 CKG) passing along Lea Valley Road between the reservoirs near King George's Sailing Club on 17 March 2012. This is on the section taken over from route 121, and is one of two stretches that could sometimes be a bit of a racetrack in Grey Green days, though modern driving style is much more muted; the section between Enfield and Potters Bar also has potential to pick up a bit of speed. 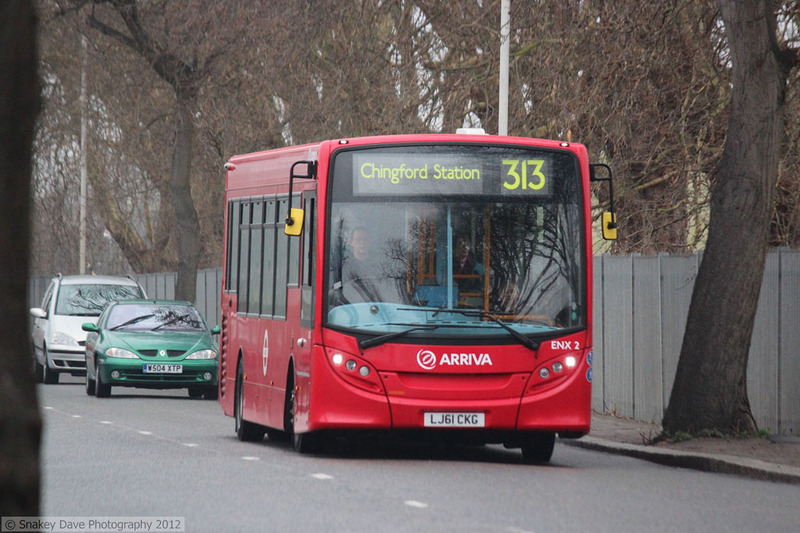 The second photograph is of sister vehicle ENX4 (LJ61 CKL) taking stand time at Chingford station on 21 February 2012.